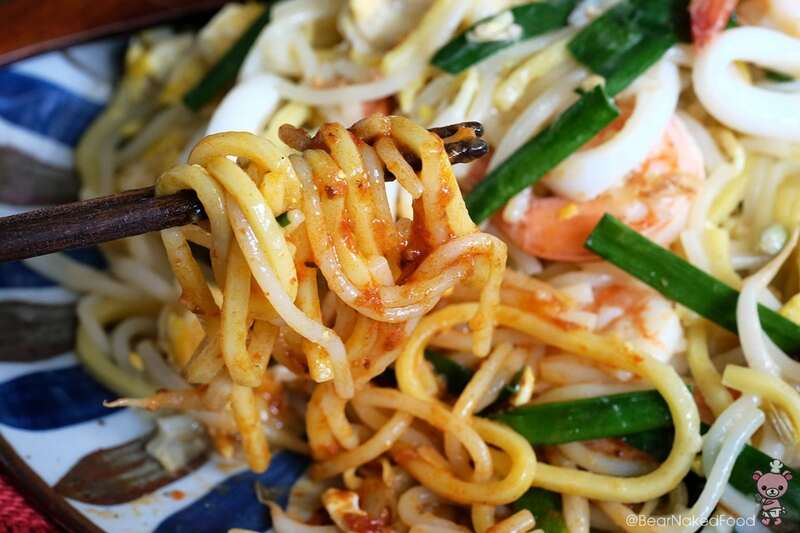 Fried Hokkien Prawn Mee or Noodles is my princess’ all-time favorite local food. Actually, mine too. 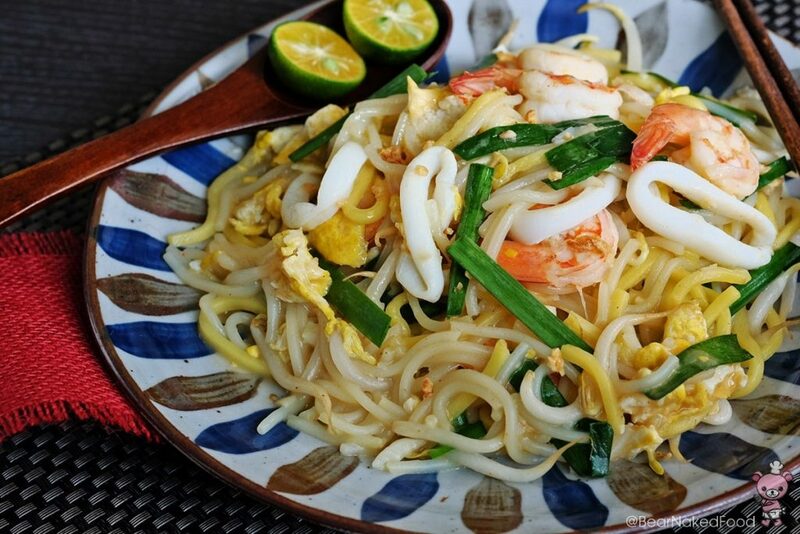 The smooth, silky texture of the noodles laced with umami-filled prawn-y goodness is simply just irresistible. I guess it could also be the amount of pork lard / oil that went along in the noodles. Since we are making this at home, I opted to omit the pork lard and pork belly. 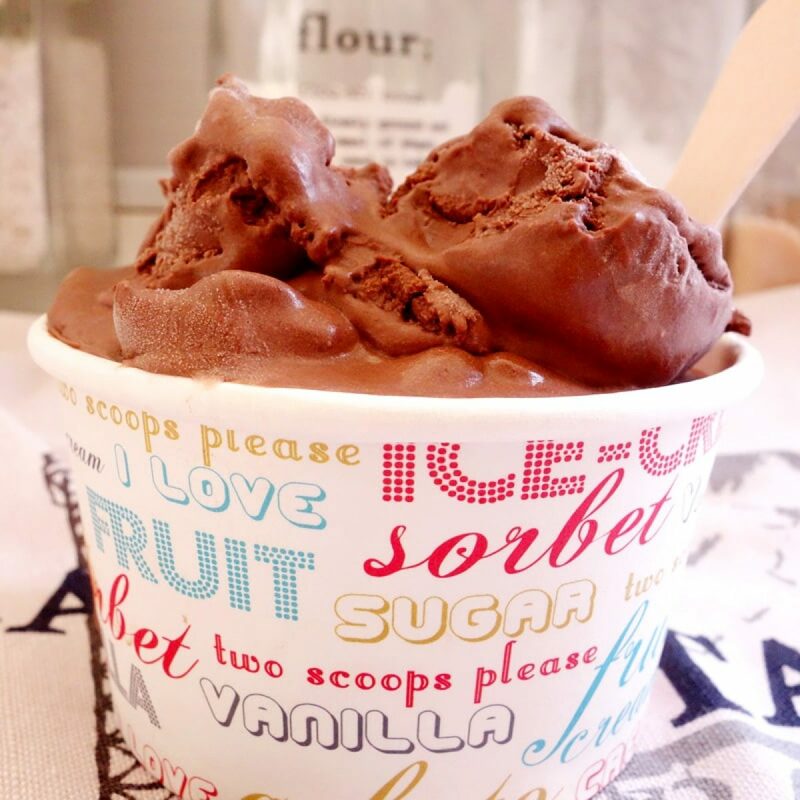 The end result – still really delish! 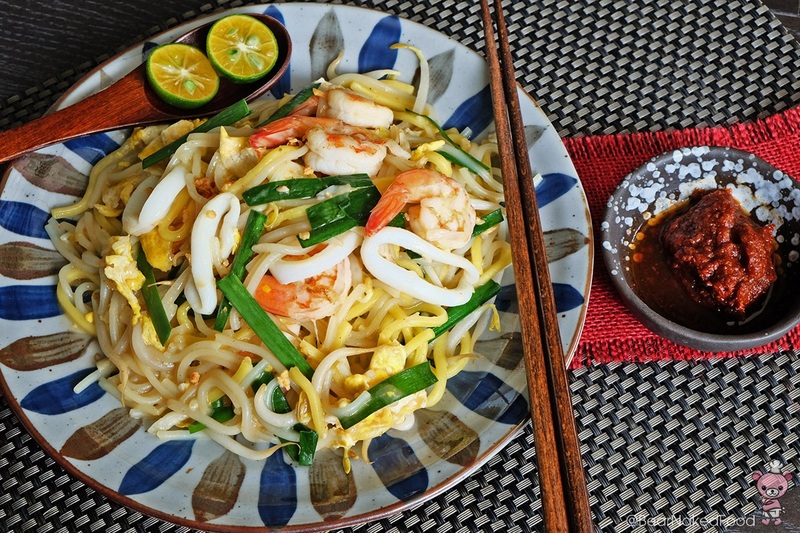 Honestly, making this dish is really quite simple yet satisfying. 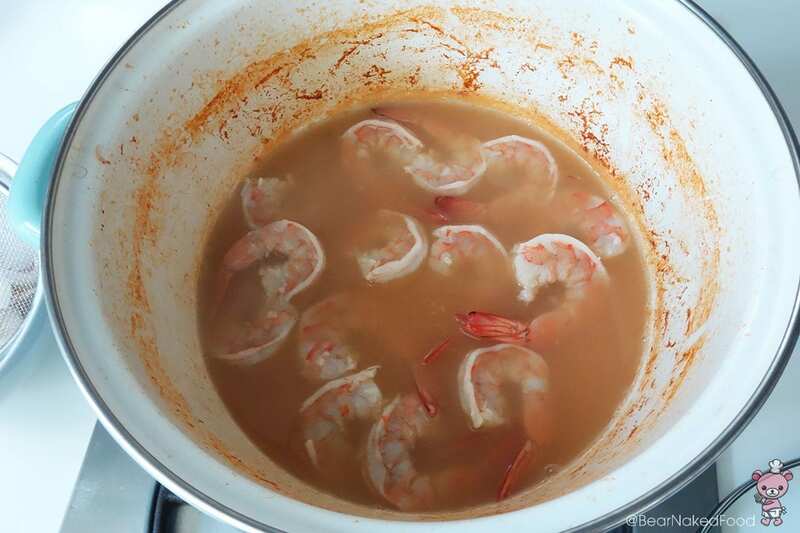 The only step that needs a little more preparation time is the prawn stock. 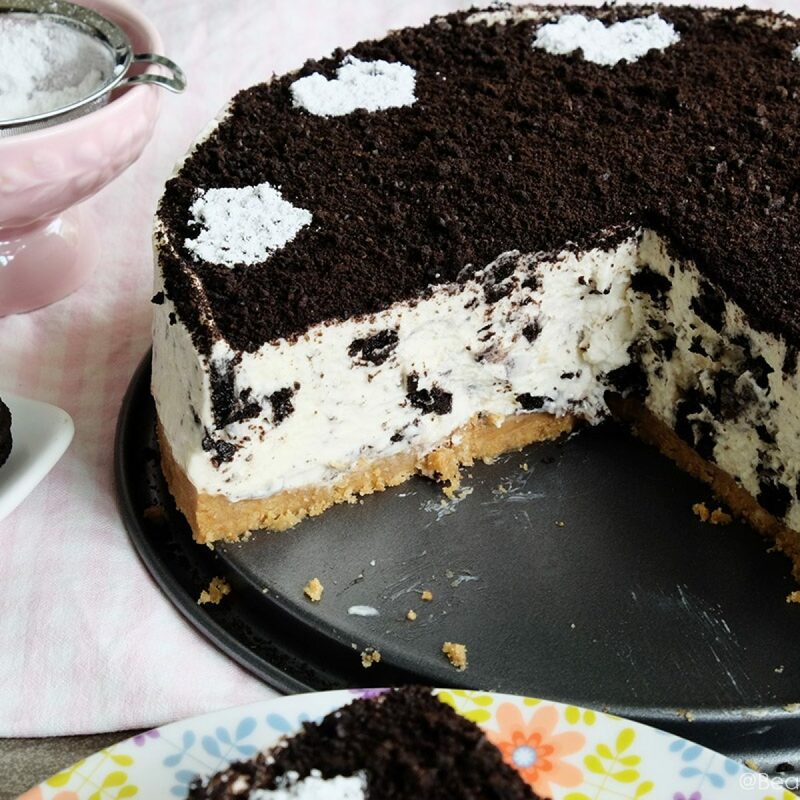 But I can assure you the final product is very well worth it! 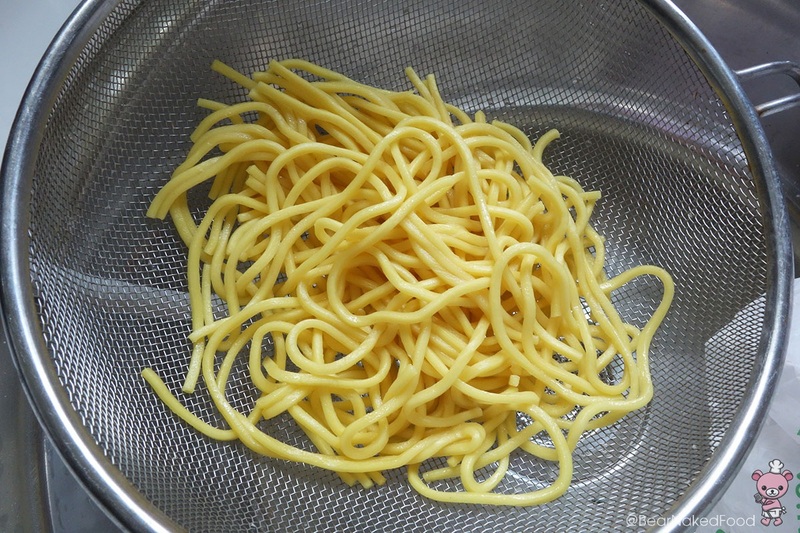 I like to give the yellow noodles a quick rinse with hot water to get rid of excess grease. 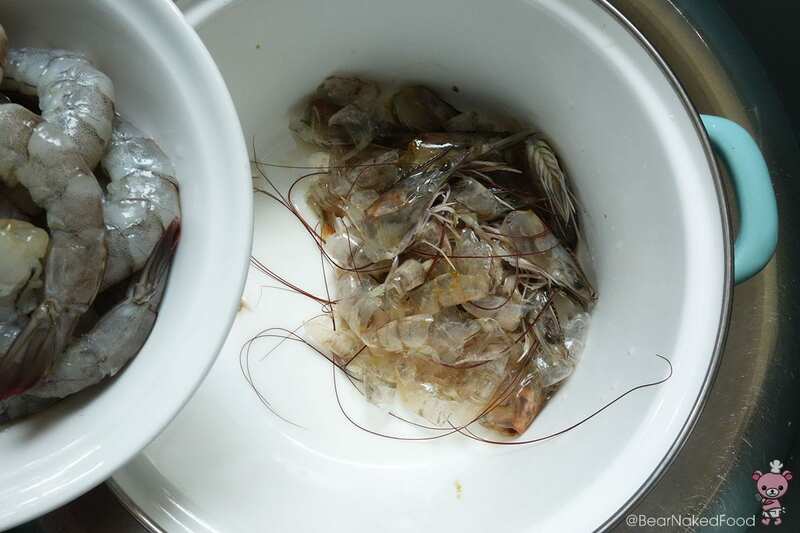 Rinse the prawns, peel off the shells and remove the veins. 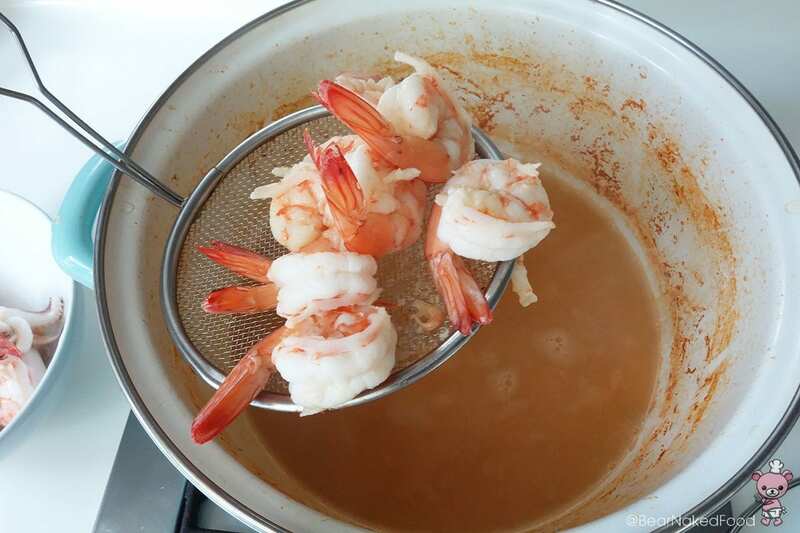 To prepare the prawn stock, put the shells and heads in a medium pot and stir fry for a minute until fragrant. Add in water and bring to boil. 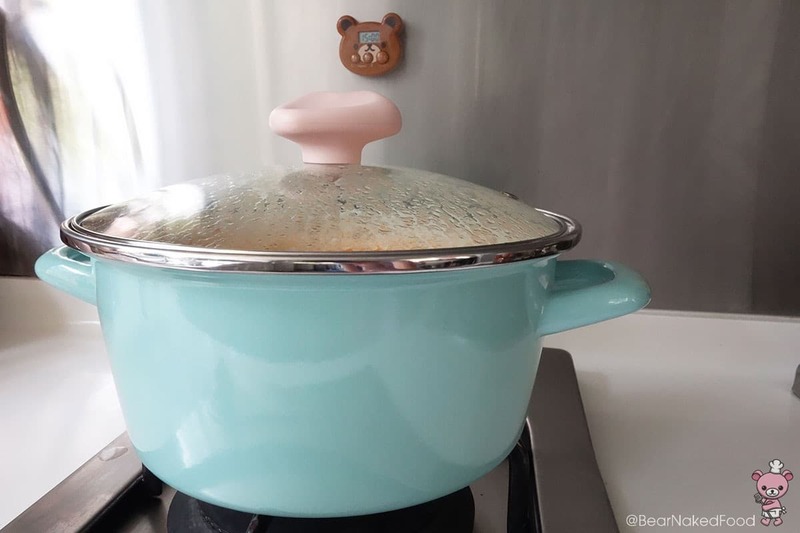 Cover and simmer for 15 mins under low heat. Meanwhile, clean and remove skin and gut from the squid. Leave the squid whole. After 15 mins, discard all the shells (including heads) in the stock and turn up the heat. 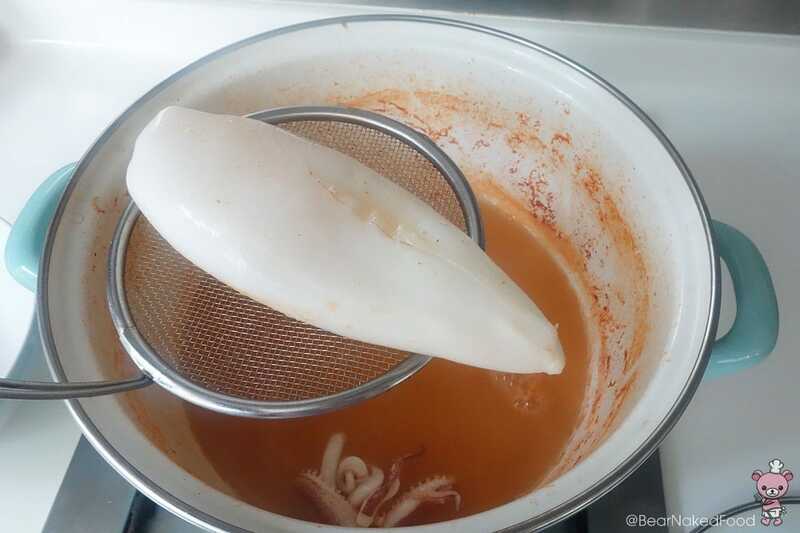 Add in whole squid and bring to boil for 1 minute until it firms up. Do not overcook the squid or it’ll become rubbery. Remove from stock and set aside. When it’s cooled, cut into ½ inch rings. Lastly add in the prawns and when they turn red and opaque, fish them out. 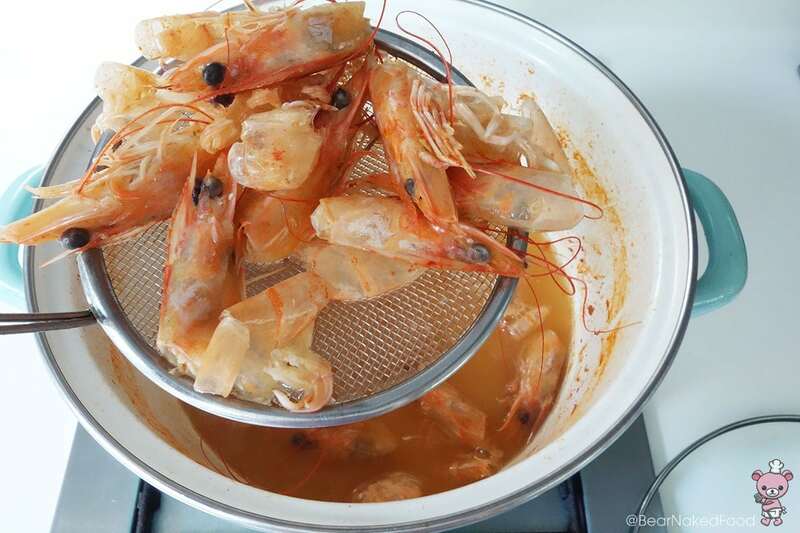 Your prawn stock is ready. Assemble all the ingredients at your cooking station. 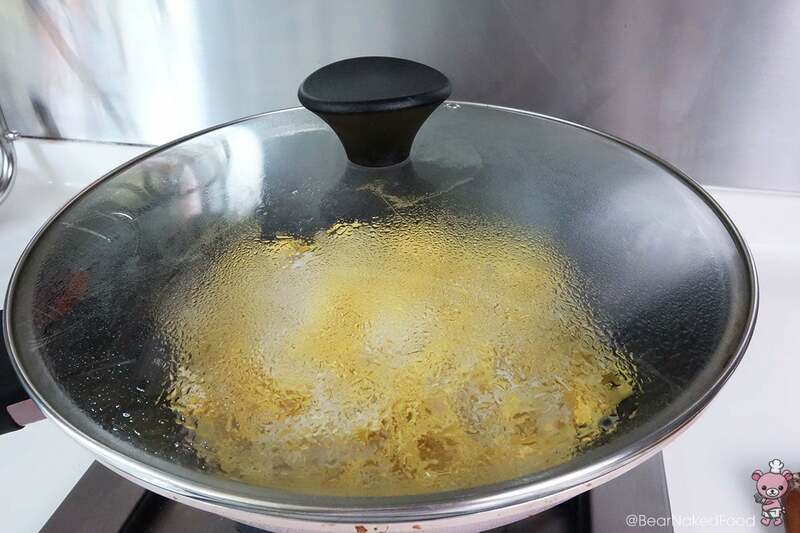 Add 3 tbsp vegetable oil into a heated wok or pan. 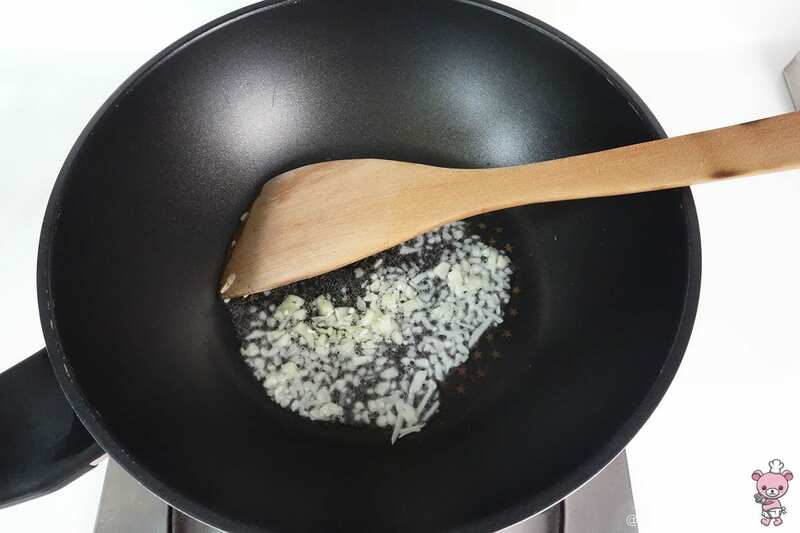 Sauté the minced garlic for a few seconds and add in the beaten eggs. 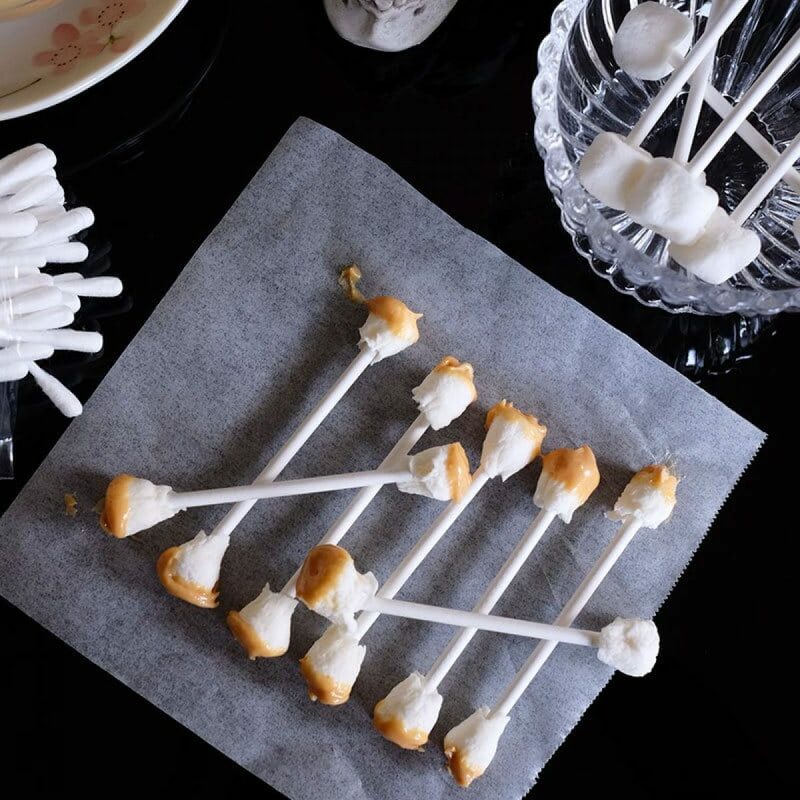 Break and stir the eggs with the spatula until they are separated into small pieces. Add in both noodles, 1/3 of the stock and stir well. Cover and cook for 1 min until most of the stock is absorbed into the noodles. 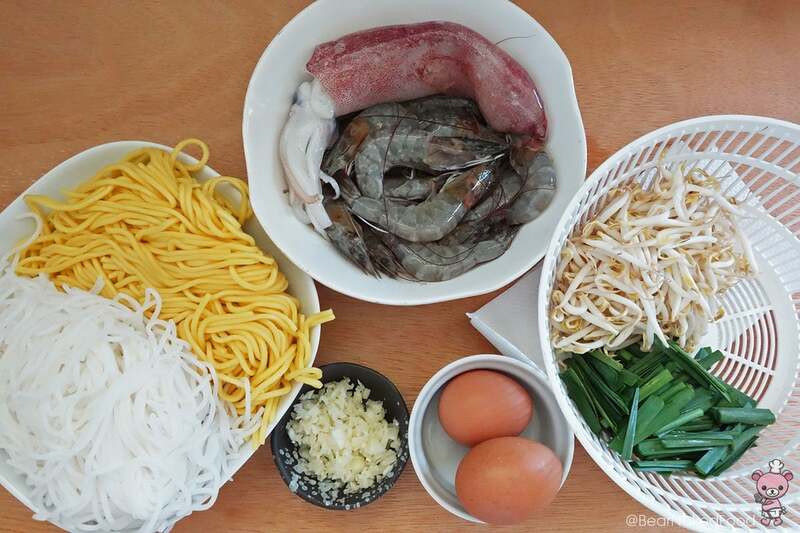 Add in the seasonings, prawns, squid, bean sprout and Chinese chives, along with the rest of the stock. 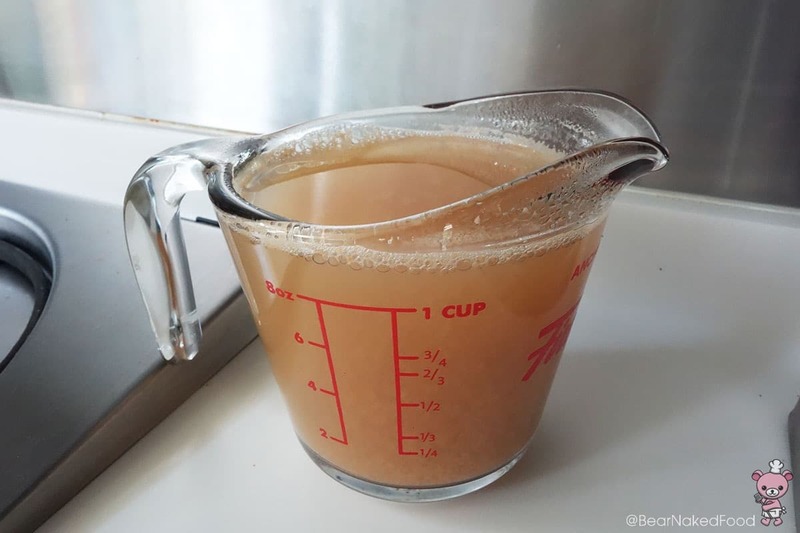 Mix all ingredients evenly and cook until most (but not all) of the stock is absorbed. It should be still be slightly saucy. 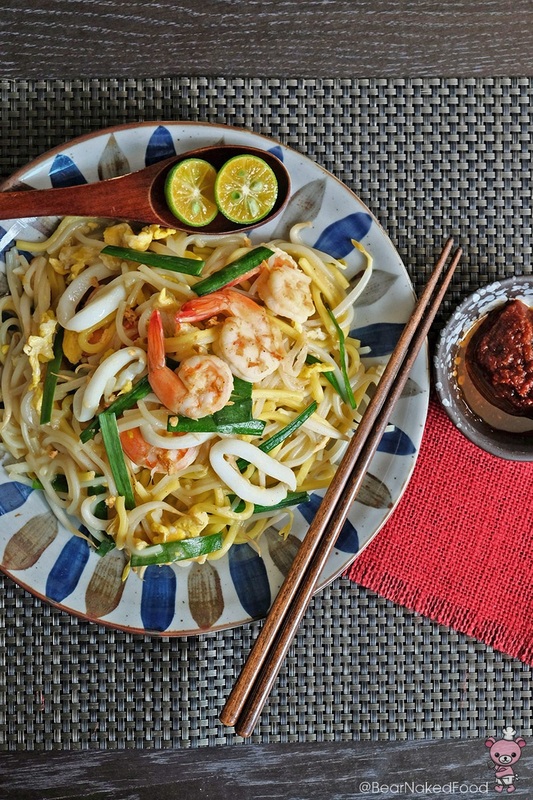 Serve hot with a few squeezes of lime juice and a dollop of sambal chili. 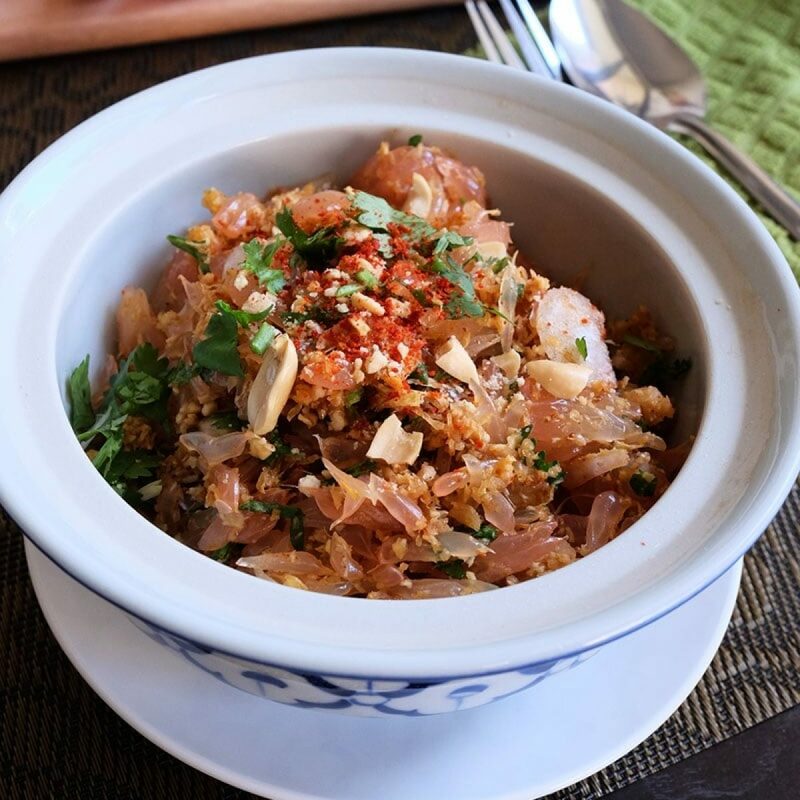 To prepare the prawn stock, put the shells and heads in a medium pot and stir fry for a minute until fragrant. Add in water and bring to boil. Cover and simmer for 15 mins under low heat. Lastly add in the prawns and when they turn red and opaque, fish them out. 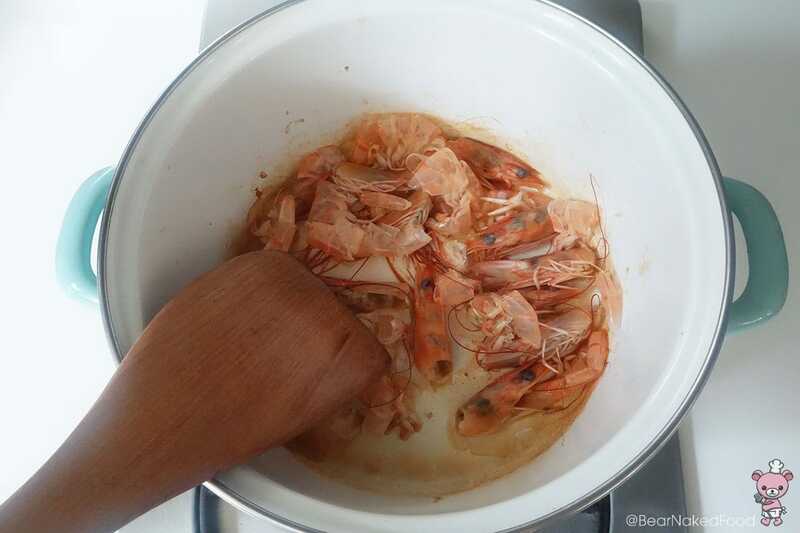 Your prawn stock is ready. 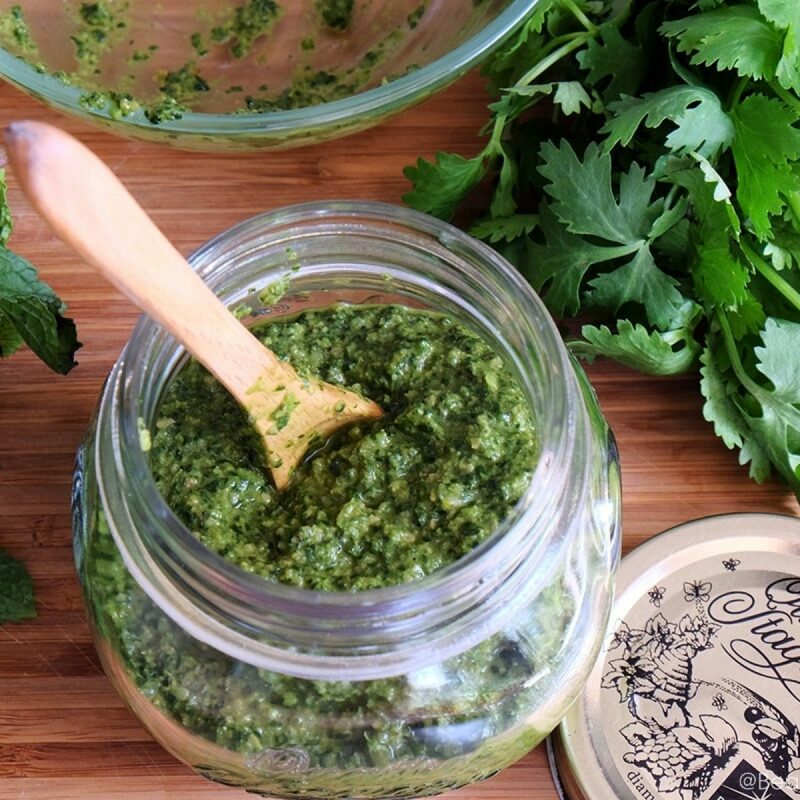 Assemble all the ingredients at your cooking station. 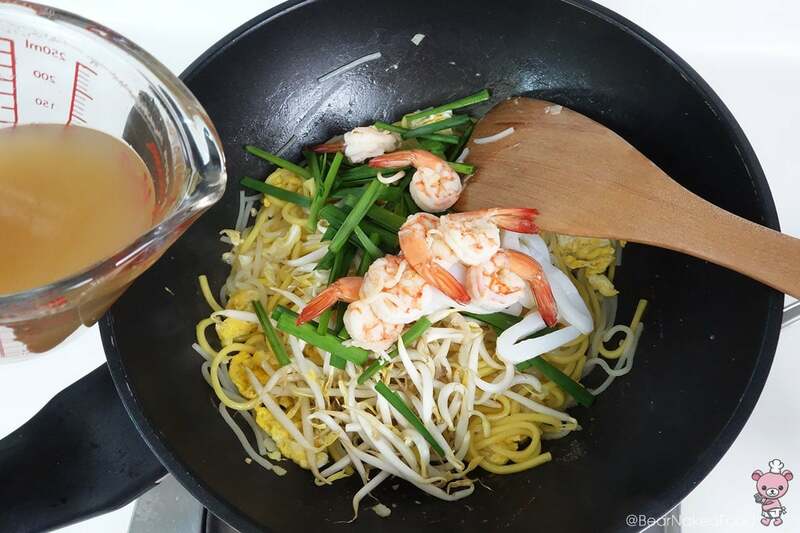 Add 3 tbsp vegetable oil into a heated wok or pan. 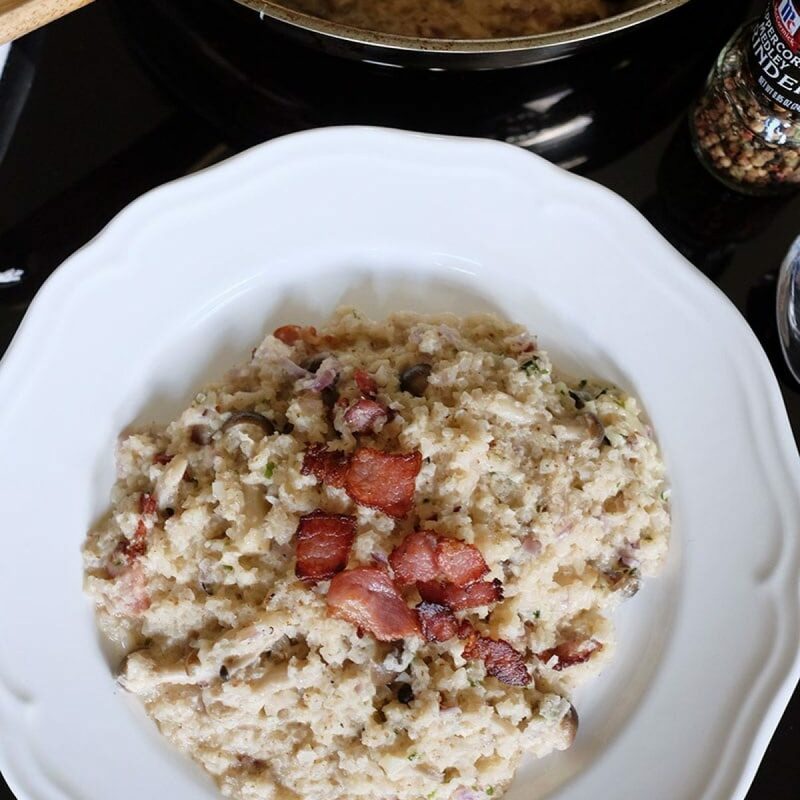 Sauté the minced garlic for a few seconds and add in the eggs. 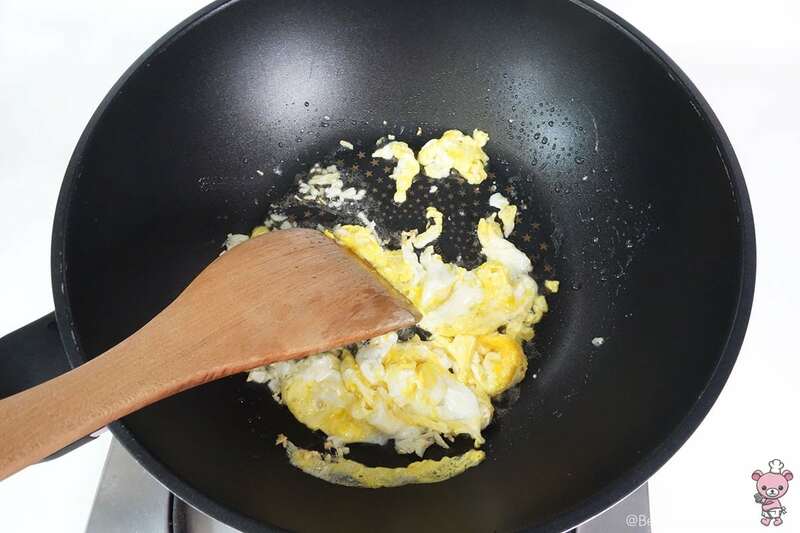 Break and stir the eggs with the spatula until they are separated into small pieces. 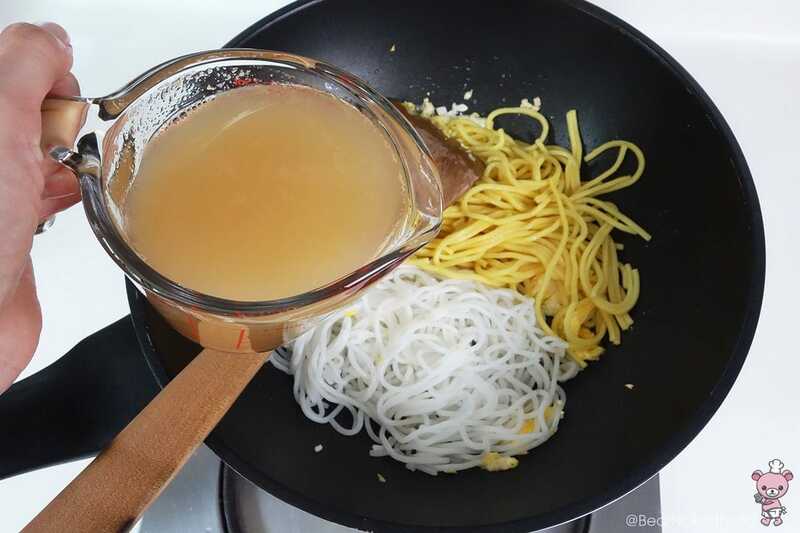 Add in both noodles, ⅓ of the stock and stir well. 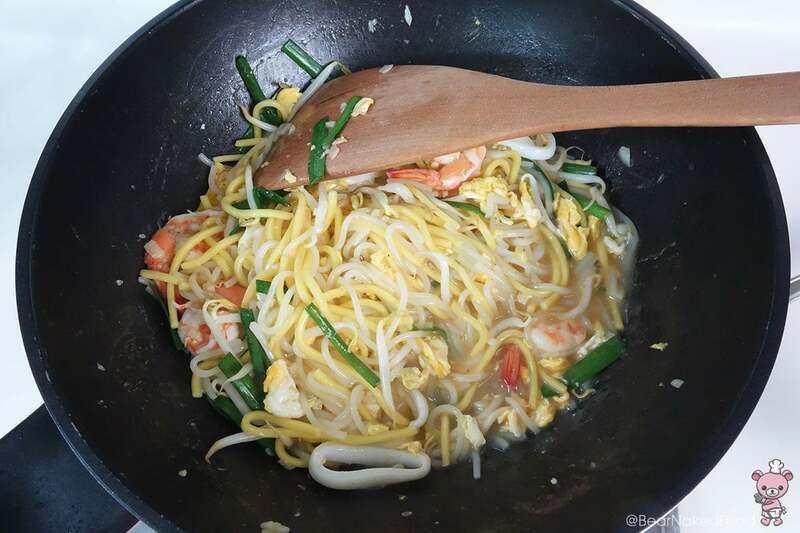 Cover and cook for 1 min until most of the stock is absorbed into the noodles.